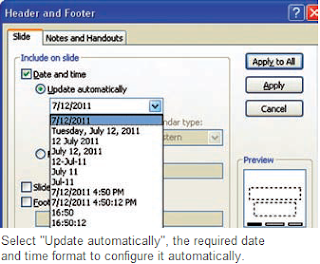 In PowerPoint, you can automatically update time and date for every slide. If you regularly use the same presentation, but want to keep it updated with the current time and date then you can easily do so. Instead of doing it manually, you can change the settings to auto. To configure PowerPoint so that it automatically updates the date and time, go to ‘Insert’ menu, click ‘Date and Time’. Then on the ‘Header and Footer’ dialog box that appears, click on the ‘Slide’ tab. Here ensure that the ‘Date and time’ check box is selected. Select the ‘Update automatically’ option and here from the drop-down list, select the required date and time format that you want to show in your presentation. Also, select the ‘Don't show on title slide’ check box if you do not want to display the date and time on the title slide. Finally, click on ‘Apply to All’. The date and time will be updated whenever you reload the PowerPoint document or begin a slide show.